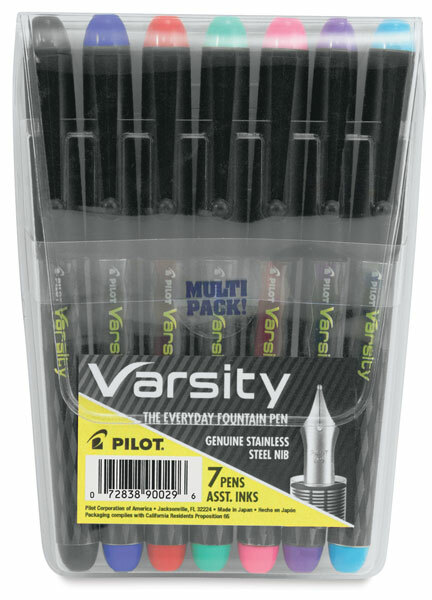 The Pilot Varsity fountain pen combines contemporary design and modern convenience with the smooth writing of a liquid ink fountain pen. 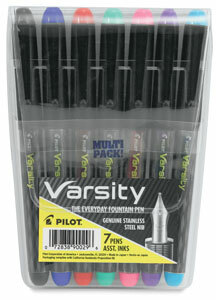 Varsity is lightweight and disposable without the messy cartridge changes that classic fountain pens are known for. The set contains 7 colors in a convenient plastic storage pouch. Colors include Black, Blue, Red, Green, Purple, Turquoise, and Pink. ® Pilot is a registered trademark.® Varsity a registered trademark.